The Great Gappo can offer you a fun show for the whole family. 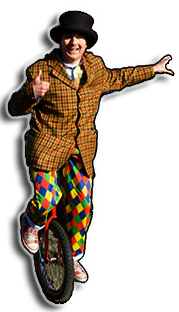 There’ll be clowning around, Juggling, Alfie the Dog, Magic, Balloon modelling etc. With plenty of opportunities for budding stars to join in. Be prepared for lots of shouting, laughter and a juggling good time. The Great Gappo also provides 2 Hr parties with Music and games as well as above Show with lots of participation from all the guests. Walkabout and Queue Entertaining with juggling, ball spinning, Magic and unicycling there is plenty to keep you entertained and even a chance to join in.